O'Quince's Kissed By an Angel is our retired happy tail girl at 10 years old. She is the one all the others look up to and know will keep them safe. She is the trainer of many a puppy. 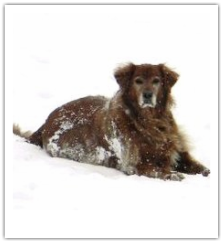 Angel is a very smart girl and has always had a very keen sense for hunting and her surroundings. She works the field from side to side covering the land quickly and swimming is one of her very favorite things. Angel produced 2 beautiful litters at O'Quince. We call her our little red bear since she is the darkest of color in the golden breed. Angel is a certified Obedience/Therapy dog and playing with a tennis ball to entertain everyone is her very favorite thing in life. 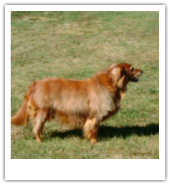 We love this beautiful red golden, "She is our Angel". Angel is at the Rainbow Bridge now playing with all the tennis balls she can get in her mouth and looking after Shilo our first Golden .